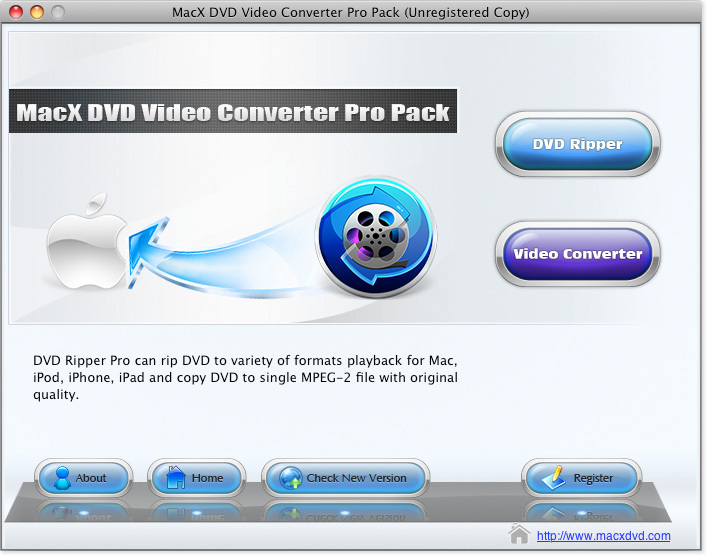 MacX DVD Video Converter Pro Pack, as a powerful combination of Mac DVD ripper & video converter, online video downloader, screen recorder and video editor, provides one-stop solution to fulfill all DVD backup and video conversion needs. It can rip any DVDs and convert HD/SD videos to MP4, AVI, MPEG, FLV, MOV, WMV, etc for playback on iPhone, iPad, Android. Besides, with this handy Mac DVD video converter, you can also download videos from 300+ online video sites, record screen, edit video and extract audio from DVD or video. With a user-friendly interface, MacX DVD Video Converter Pro Pack makes it easy to navigate for novice and savvy users. Advanced technology including high quality engine, multi-core CPU, batch processing, hyper threading is adopted to deliver the fastest converting speed and zero quality loss. 5.2.1 update has added compatibility with Mac OS Sierra. 1. Rip any DVD to MP4, MKV, MOV, FLV, MPEG, AVI, MP3, etc. 2. Constantly upgrade to remove any DVD copy protections, including CSS, region code, Sony ARccOS and New Disney DVD copy protection. 3. Convert any video to popular video/audio formats, such as MKV to MP4, M2TS to MP4, MKV to AVI, WMV to MOV, AVI to iMovie, FLV to AVI, MP4 to MP3, etc. 4. Convert DVD and videos to iPhone SE, iPhone 7/7 Plus, iPad Air 2, iPad Mini 4, iPad Pro, The new Apple TV, Galaxy Note 5/S6 edge+, HTC One M9, Surface Pro 4, Xperia Z5/Z4/C4/M4, PS4, etc for easy playback. 5. Backup DVD movies to MPEG2, MKV and ISO image quickly with zero quality loss. 6. Download video from YouTube, FaceBook, Vimeo, Vevo and other 300+ online video sites and convert YouTube video to MP4, AVI, MOV, etc. 7. Edit video: trim/crop/merge video, add watermark & external subtitle, adjust parameter settings, etc. 8. Record screen activities, make slideshow from photo library for sharing on YouTube, Facebook, etc. 9. Extract audio from DVD & video in MP3 format and capture PNG picture from original files.